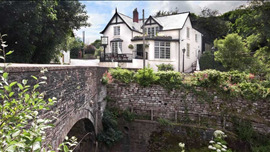 Famous for its amazing location by a bridge over the River Usk at Tredunnock, the Newbridge Inn has morphed into the Newbridge on Usk and has found a new lease of life under the same ownership as the famous Celtic Manor Resort. This substantial inn now combines the virtues of a beamed pub-with-rooms and the cosmopolitan flavour of a stylish restaurant. The menu has a traditional backbone but with plenty of modish ideas and influences adding an extra dimension to proceedings. Simple offerings such as beer battered fillet of fresh cod served with hand cut chips, home-made tartar sauce and minted mushy peas are overshadowed by the likes of Madgett's Farm slow roast duck breast with braised red cabbage, pumpkin puree and duck fat chips. You might begin with Dorset crab and haddock fish cake with spring onion and duck egg hollandaise and round things off with - say - warm cinnamon doughnuts, toasted marshmallows with a mug of hot chocolate. Wines are a well-chosen, diverse bunch with a strong contingent from the New World.